Complex dental damage cases present no match for Dr. Byron McKnight’s full-mouth reconstruction skills. Dr. McKnight can undo years of decay and wear and tear by combining procedures to revive oral health. 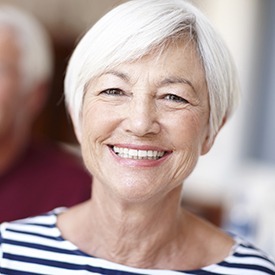 A full-mouth reconstruction makes use of multiple restorative dentistry services including dental implants, gum disease therapy, root canals, and porcelain crowns to restore all of your teeth. You have missing teeth because of extensive decay or dental injury. You have chipped or broken teeth. Your teeth have been worn down because of tooth grinding (bruxism), acid reflux, or acidic foods. You experience facial pain or headaches in response to bite problems. Dr. McKnight will begin the process by assessing the health of your teeth, jaw, and bone to determine which restorative procedures will work best. A full-mouth reconstruction requires customized treatment plans because every case is unique. Once your treatment has been planned, Dr. McKnight will take your ailing mouth and turn back the clock on your smile, returning your mouth to a healthy state.